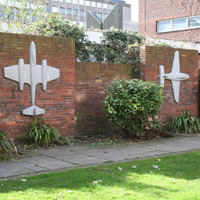 Aviation murals, designed and executed by Darsie Rawlins, were placed in the Jubilee Garden (behind the City Museum in Brunswick Road) in 1976. They were commissioned by the Trust to commemorate famous aircraft built by the Gloster Aircraft Company, which closed in 1960. The murals were restored by the Trust in 1998 and have more recently been moved to the Jet Age Museum at Staverton near Gloucestershire Airport, where they adorn the outside of the building which houses the Gloucestershire Aircraft Collection. For more information about the Museum, visit www.jetagemuseum.org. Go back to Gloucester Civic Trust achievements or find out about GCT commissioning the Emperor Nerva Statue.